We are offering latest collection of Indian Bollywood fashion Tunics, Kurtis, Kurtas-Tops and embroidered kurtis,printed kurtis. Stylish Kurti Nikhaar's Indian Fashions carries a gorgeous selection of latest fashion Kurtis/ Tunics/Tops/Kurtas. Our Kurtis are comfortable yet elegant, versatile and stylish, trendy yet modest. These are just some of the qualities of this long lasting fashion trend. Keep in mind the right color, the right fabric and your personal style... you will always create a lasting impression with this ultimate time defying fashion statement. Our experienced fashion designers have designed these kurtis in compliance with the current fashion trends & styles. Offered designer kurtis are the perfect combination of contemporary and traditional designs. These kurtis are available with us in alluring designs, beautiful colors, patterns and sizes. We offer huge range of Designer Kurtis/Tunics/Kurtas/Tops.The offered range of kurtis is available with us in various colors, beautiful patterns and sizes to meet the exact requirement of our clients. Offered kurtis are very stylish and comfortable to wear. We are offering Designer Kurtis which are fabricated using pure cotton fabric and can be embellished, designed and styled as per the different requirements of the customers. These are available in Indian ethnic style and fabric ornamentation. Designed beautifully with work of traditional embroidery along with a modern contemporary feel. Vibrant black kameez styled with white printed motifs on the center and pink and black printed patterns on the right side panel. The black sleeves have dot designed patch border. White churidaar and black and white shaded dupatta complete the look. 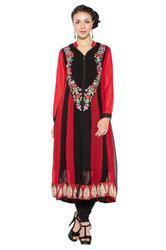 Ladies Fashion Kurta. Offered ladies fashion kurta is designed & developed by our experienced and highly skilled fashion designers. To manufacture these kurtas our professionals make use of excellent quality fabric and imported threads. These kurtas posses many quality attributes like smooth texture, skin-friendliness, shrink & odour resistance and color-fastness. Stylish Kurti Designer Trendy Look party wear tunic kurti fashion and traditional designs. Our designs are best in market and as well as rates also. Please contact us for latest collection of Woman's Wear. We also take bulk orders from wholesalers in all over India and also take export orders with shipping. The offered range of top tunic kurtis is hugely acclaimed among clients for its striking patterns, attractive designs and stylish look. REadymade Kurtis We are a distinguished manufacturer, wholesaler and trader of a wide assortment of Ladies Garments. our products are a perfect blend of contemporary fashion and traditional designs. Our designs are best in market and as well as rates also. Please contact us for latest collection of Woman's Wear. We also take bulk orders from wholesalers in all over India and also take export orders with shipping. These kurtas posses many quality attributes like smooth texture, skin-friendliness, shrink & odour resistance and color-fastness. We offer Ladies Designer Cotton Kurti/Tunic,Casual Tunic,Exclusive Tunic.These Tunics can be worn on any occasion ranging from casual wear to formals and party collections. With the efforts of our professionals, we are able to manufacture superior quality Ladies Designer stylish fashion western tunic tops These Ladies top are made from high quality of material which ensure durability at its user end. This Tops Western dresses in casual, and semi formal events. Modern technologies has modified the style and designs. attractive designs and stylish look. Nikhaar Creations is one of the leading manufacturers, exporters, wholesale suppliers in the production of designer ladies kurtis. We have attained our achievements by obtaining the best quality products. We supplied fashionable trends to our valuable customers. We offer new fashion arrivals that suits current fashion trends and our Kurtis are a perfect combination of style, color and pattern. REadymade Kurtis are very famous and highly preferable clothing wear World wide are best fashion wear with outstanding quality as well as the fabric has enormous edge over others. farwacouture have ability to supply all branded Pakistani Kurtis. We deal in Stitched Dresses We also make custom size suits as per your design, These designer Indian Kurtis give you a smart and classy look. This is a latest Tunic Fashion dress consists of skinny jeans in navy blue color and a fabulous sleeves with rough and baggy style of neck type which gives casual touch to this dress. All such types of dresses are basically for casual use.